Born in Madison, Wisconsin in February 1962, Tammy Baldwin graduated (with degrees in mathematics and government) from Smith College in 1984 and earned a Juris Doctorate from the University of Wisconsin Law School in 1989. While still pursuing her legal studies, Baldwin at age 24 was elected to the Dane County board of supervisors. Six years later, in 1992, she was elected to the lower house of the Wisconsin legislature where she served, as a Democrat, until 1998. In 1998 Baldwin ran for a seat in Wisconsin’s Second Congressional District. With a $1.5 million war chest (much of which came from the feminist group EMILY’s List), she won the general election with 53 percent of the vote. Upon joining the House of Representatives, she became a member of the Congressional Progressive Caucus. In October 2002, Baldwin voted against the resolution authorizing the use of military force against Iraq. Thereafter, she became a vocal critic of America’s Iraq War effort and often voting against funding it. In 2003 Baldwin served on the advisory committee of the Progressive Majority, a political networking group dedicated to electing leftist candidates to public office. In 2005 she joined the Out of Iraq Congressional Caucus. On December 22, 2009, Baldwin was one of 33 U.S. Representatives who signed a letter to Hillary Clinton, calling on the Secretary of State to pressure the Israeli government to end its ban on Palestinian student travel from Gaza to the West Bank. An outspoken advocate of a single-payer, government-run health-care since her days as a state legislator, Baldwin introduced the Health Security for All Americans Act, aimed at creating such a system, multiple times beginning in 2000. In November 2009 she voted for the version of healthcare reform that passed in the House and included a public option, a government-run healthcare plan that would have competed with private insurers. She ultimately voted for the Obamacare bill that became law in March 2010. On January 27, 2010, Baldwin was one of 54 members of Congress who signed a letter imploring President Barack Obama to use diplomatic pressure to end Israel’s blockade of Gaza—a blockade which had been imposed in order to prevent the importation of weaponry from Iran and Syria. In November 2010, Baldwin and 15 other congressional Democrats met—either personally or through their respective staffers—with supporters of the Freedom Road Socialist Organization/FightBack (FRSO/FB), a Marxist-Leninist group. Those FRSO/FB supporters expressed their condemnation of “the FBI raids and grand jury subpoenas of people doing international solidarity work and anti-war organizing.” It was reported that Baldwin and her congressional colleagues expressed “genuine concern” about the FRSO/FB complaints. Baldwin maintains that the greenhouse gas emissions associated with human industrial activity cause potentially catastrophic global warming. To deal with that perceived threat, she supports the implementation of cap-and-trade programs. Further, she has proposed legislation to create a greenhouse gas registry that would catalogue the levels of carbon emissions associated with all manufactured products, so as to enable consumers to know the “carbon footprint” of each product. Baldwin also has co-sponsored legislation to ban oil drilling in the Great Lakes, and legislation to help reduce global population as a strategy for combating climate change. In 2012, Baldwin defeated Republican Tommy Thompson (Wisconsin’s former governor) to win a seat in the U.S. Senate. In January 2015, the Center for Investigative Reporting released a report revealing that the Veterans’ Administration (VA) facility in Tomah, Wisconsin was dispensing strong narcotic painkillers to its patients with alarming and inappropriate frequency, and that one of those patients had died of an overdose in 2014. After the story broke, Baldwin called for a federal investigation of the Tomah facility while indicating that she theretofore had been aware of the problem. But in March 2015, a former Tomah VA empoyee named Ryan Honi reported that: (a) an Inspector General report had made Baldwin’s office aware of the Tomah abuses as early as the summer of 2014; (b) Honi had repeatedly emailed and called Baldwin’s office exhorting the senator, without success, to address the problem; and (c) Honi had spoken at length with Baldwin about the problem in November 2014, only to be instructed not to take the story public, lest Honi and other VA staffers end up getting fired as a result. In April 2018, Baldwin was one of 12 U.S. senators who sought to punish the Sinclair Broadcast Group – widely perceived as a conservative media company – which (a) consisted of 193 television stations and 614 channels in 89 markets nationwide, and (b) had recently announced plans to acquire the Tribune Media Company’s 42 TV stations in 33 markets, a merger that, if completed, would extend Sinclair’s reach to 72% of all American households. The twelve senators included Baldwin, Independent Bernie Sanders, and 10 other Democrats: Richard Blumenthal, Cory Booker, Maria Cantwell, Edward Markey, Jeff Merkley, Patty Murray, Tina Smith, Tom Udall, Elizabeth Warren, and Ron Wyden. Viewing the Sinclair ad as an implicit defense of President Donald Trump, who had long been under withering attack by media outlets nationwide, the senators wrote in their letter: “We are concerned that Sinclair is engaged in a systematic news distortion operation that seeks to undermine freedom of the press and the robust localism and diversity of viewpoint that is the foundation of our national broadcasting laws.” “We have strong concerns,” they added, “that Sinclair has violated the public interest obligation inherent in holding broadcast licenses. Sinclair may have violated the FCC’s longstanding policy against broadcast licensees deliberately distorting news by staging, slanting, or falsifying information.” The senators also demanded that the FCC put on hold its review of Sinclair’s potential merger with Tribune. The leftwing Americans for Democratic Action consistently rates Baldwin’s voting record as 95 to 100 percent on the left side of legislation. Click here for an overview of Baldwin’s voting record on key pieces of legislation during her years in Congress. Baldwin is a member of the American Civil Liberties Union of Wisconsin, the College Democrats of America, the International Network of Lesbian and Gay Officials, the NAACP, the National Organization for Women, and Wisconsin Citizen Action. Over the years, Baldwin has received a few donations from high-ranking officials and/or board members of Islamist organizations. Specifically, from 2015-2016, she received a total of $1,504 in contributions from individuals affiliated with the Muslim Public Affairs Council and the Council on American-Islamic Relations. 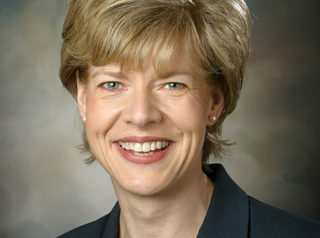 For additional information on Tammy Baldwin, click here. Further Reading: “Tammy Baldwin” (Votesmart.org, Keywiki.org); “WI Senate Candidate Tammy Baldwin Wanted Department of Peace” (Breitbart.com, 10-28-2012); “Watchdog Group Calls for Ethics Investigation of Baldwin [and VA Painkiller Scandal]” (Washington Free Beacon, 4-23-2015); “Sen. Baldwin Had Tomah VA Report for Months” (Green Bay Press Gazette, 1-19-2015). * Resources for the Sinclair Broadcasting Group matter: “Democrats Running for Office Pull Ads from Sinclair over Anchor Statements on Fake News” (TheBlaze.com, 4-4-2018); “Twelve Senators Seek FCC Probe of Sinclair News Scripts, Pause in Tribune Review” (Reuters.com, 4-12-2018); “12 Senators Want FCC to Probe Sinclair” (Newsmax.com, 4-12-2018); “Ajit Pai Rejects ‘Chilling’ Democratic Request for FCC Investigation into Sinclair” (Washington Examiner, 4-12-2018).